I had to rearrange my Nia Classes this week and next week because stuff happens in life. You know that right? You have a plan, just cruising a long and something happens. Sometimes it is just a little quirk that maybe changes your schedule a bit. Sometimes it might be something bigger that changes a lot of things. Either way, there is stuff. We all have stuff. Even if it doesn’t happen directly to us, it happens to someone who affects us. Stuff. Good stuff, bad stuff, stuff that can’t be qualified as either . . . but stuff. Sometimes you gotta drop what you are doing and deal with it. Sometimes you get a little prep time. Whether you can actually get prepared in that time is another story, huh? There are also moments when you might be able to forget the stuff and enjoy the moment that is. Recently I was able to enjoy a moment. I took a few pictures of it. Since there is “stuff” I am using my moment to fill in. 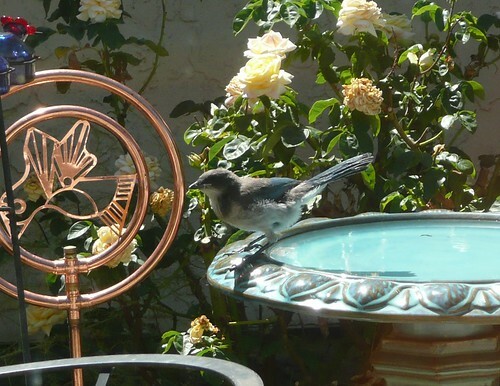 I love when animals drink out of the bird bath. My husband and I try to keep it clean and full. I am really particular during the hot days. 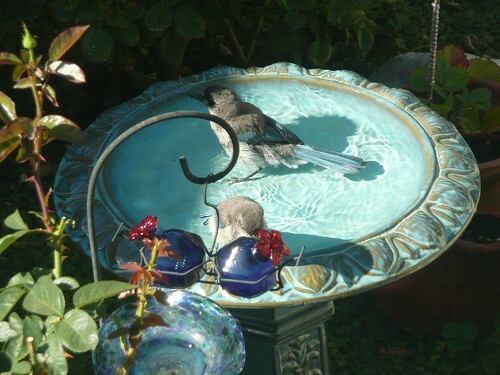 Even though I am sure the water gets really hot, I still want to make sure there is water in there for them. I like to see them drink out of it. 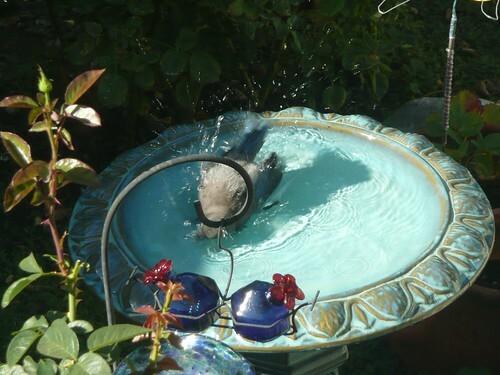 The blue jay are funny because they put their heads back and move their heads as if that is how they have to get the water down. Is that how they have to do it? Do you know? 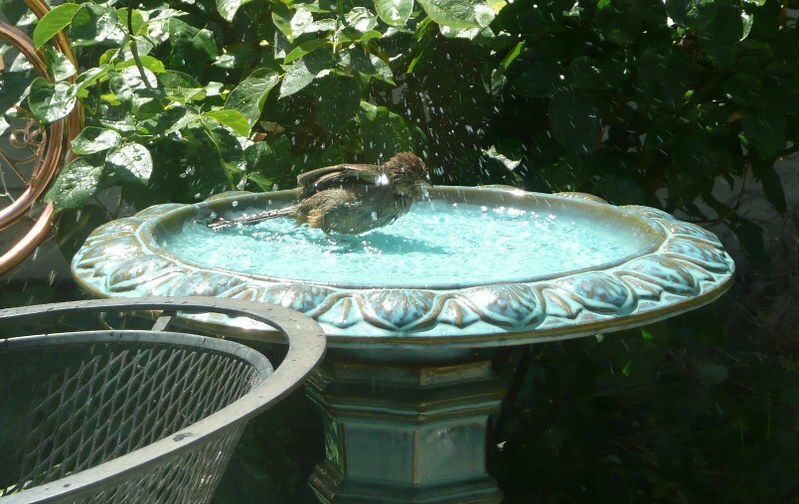 What I love more than animals drinking from the bird bath is birds taking a bath. They seem as if they really allow themselves to really enjoy it. 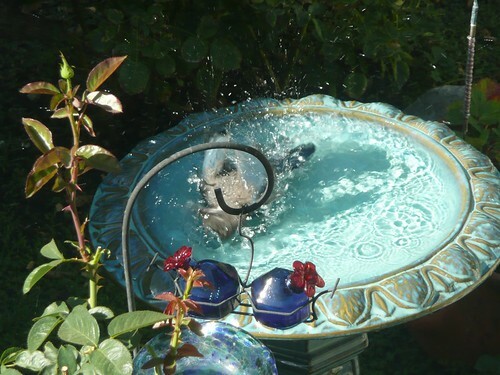 They seem to love to get to splish and splash around. I love that. I really love when I have my camera or phone close by so I can take some pictures. 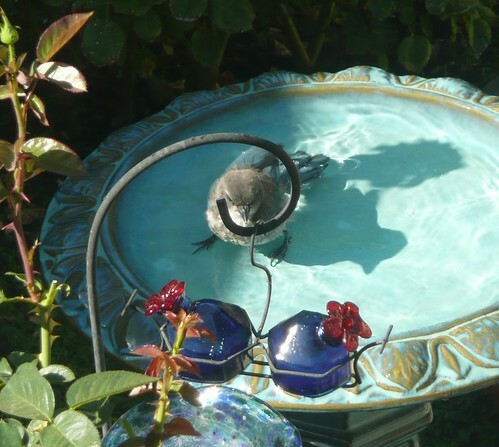 I posted a long time ago (in 2009) about the baby blue jays taking a bath. They were so funny to watch because each one was so different in how they took their baths. One would barely get wet, while another would just go crazy in the water. You can see from the pictures how he would just splash around really big. He became a big blur. It was fun to see the different personalities of the birds. 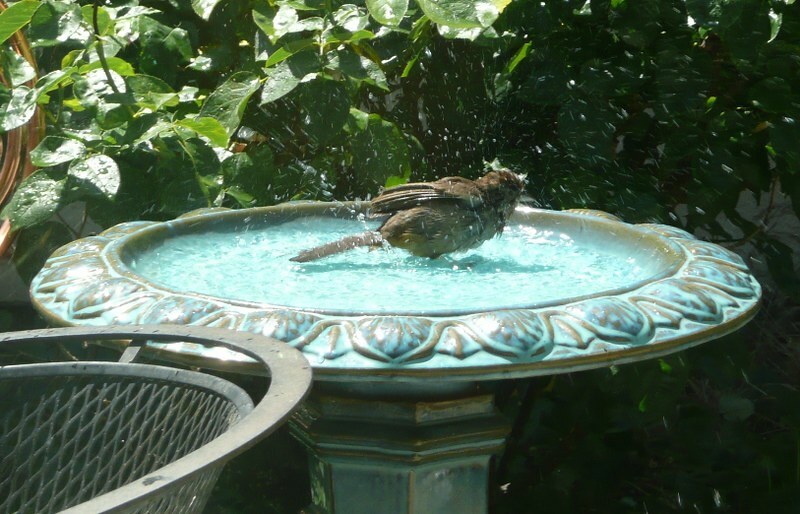 The other day, I just happen to look up as a bird hopped in the water. He would jump in splash around, then jump out, then jump in splash around, then stop, then splash, then stop. Just having a good old time. 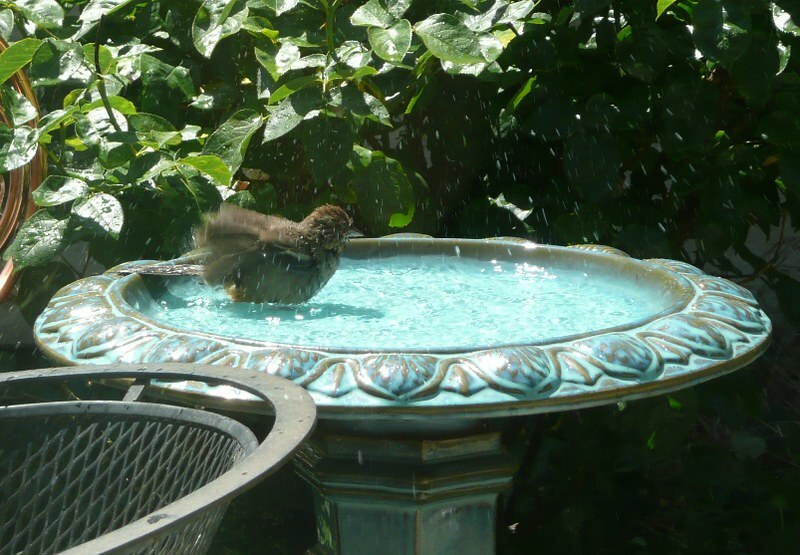 He was not a big blurry splasher like that one baby blue jay was. 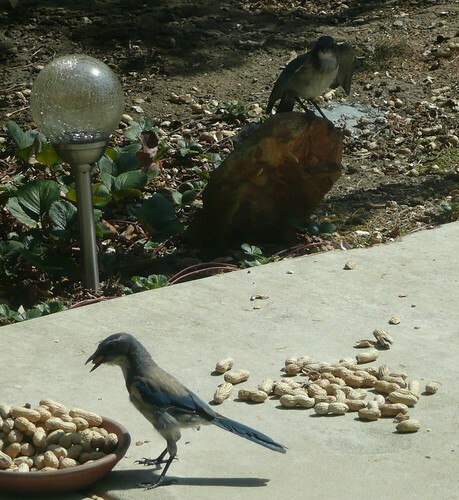 Whenever I think of that blue jay it makes me laugh because he would just get so crazy. 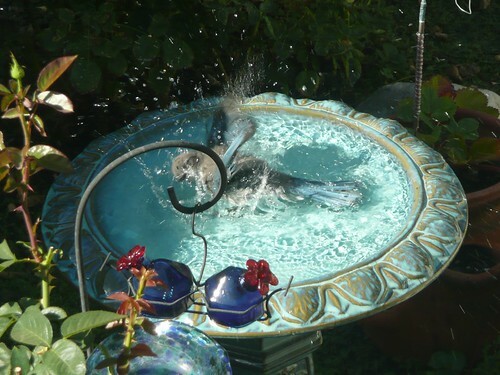 It does make me happy to see the birds actually taking a bath in the bird bath. Although I am fine if they just drink out of it. It is a nice break, either way, especially where there is “stuff”. 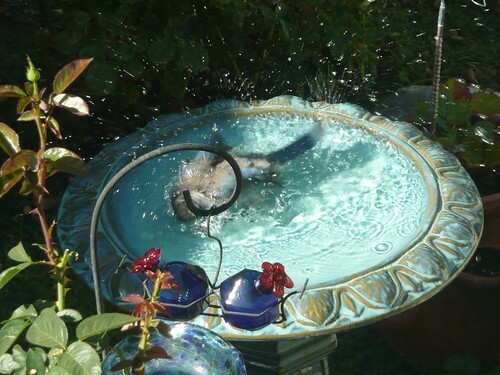 All this splishing and splashing reminds me of the Duck Walk. 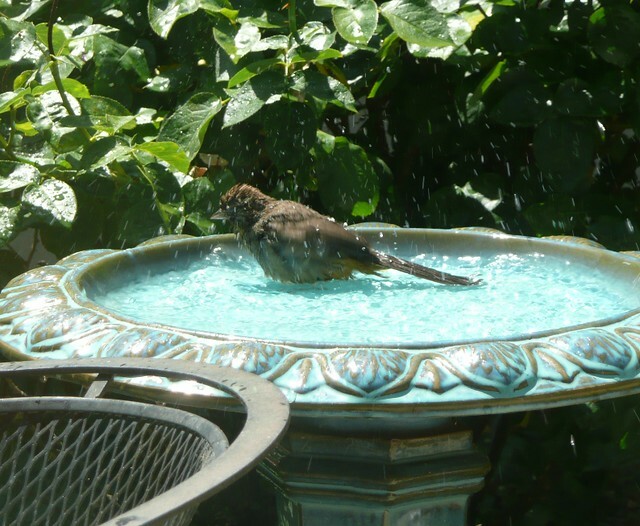 🙂 Thanks for letting me take a little break and share a bird’s bath with you. It was a nice moment. How are you doing? Have you had any moments lately? Got any stuff? Look at all the water . . . . . now this is FUN STUFF! 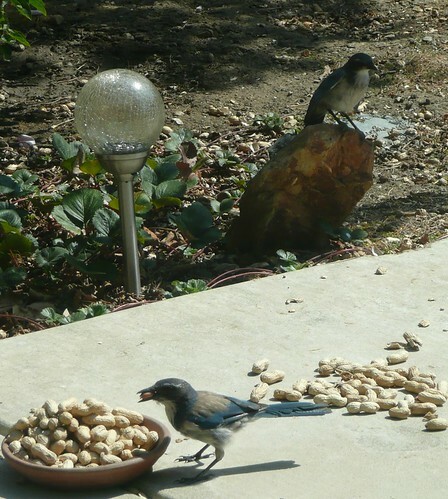 We have recently had baby blue jays surface. For the most part I don’t even know they are there. When they do make noise it is hilarious. I can’t tell how many there are. I think there are at least two, maybe three, but at least one has a hilarious voice. 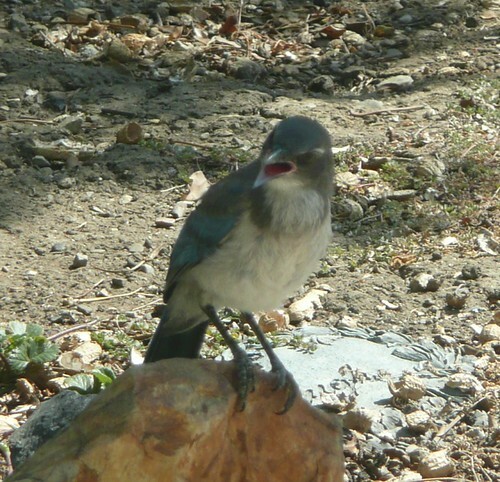 It is not the squawk of a blue jay yet. I can’t even describe it, but it makes me laugh. Whatever I am doing I will stop to listen to him. It is so funny. I tried to record it today, but . . . I only have my iPhone and the baby stopped the second I pressed record. 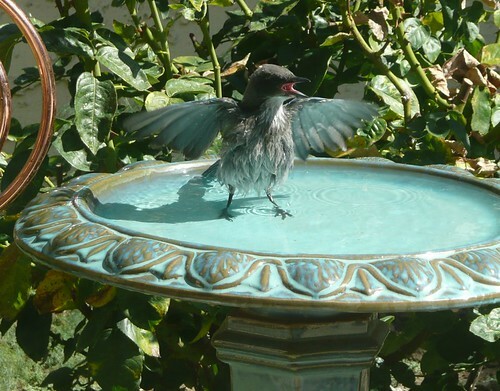 Then all the other birds started in and drowned out his little voice. 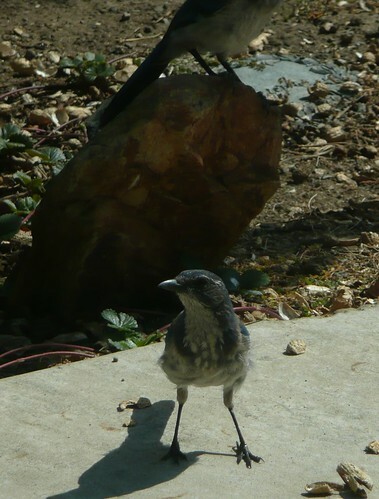 Anyway, it is Thursday, and I haven’t posted birds once this month so I thought I would share some baby pictures. The babies are deceptively large. At first, you don’t realize that the baby is the baby because he is so much bigger than the adults then it opens its mouth and makes this pathetic noise or it walks and has absolutely no grace. So, please keep in mind I am not posting this pictures because they are good pictures and I wanted to share, I am posting them because they are our babies and I wanted to share. 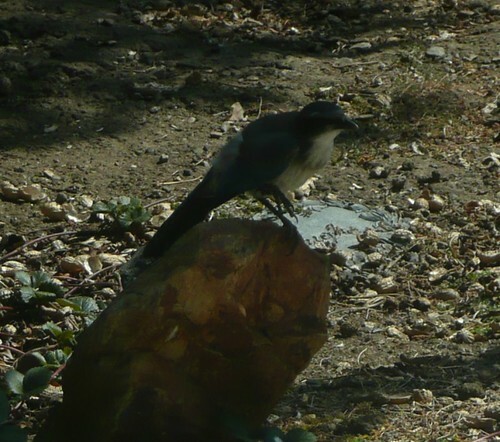 Its a beautiful day in San Jose for this bird to sit by the water. Do you see his brother (sister?) on the rock behind him? I think the one on the rock is the one that is has the funny little voice. It is so funny. Babies just stand different. They are still learning. It is so funny to watch them move. 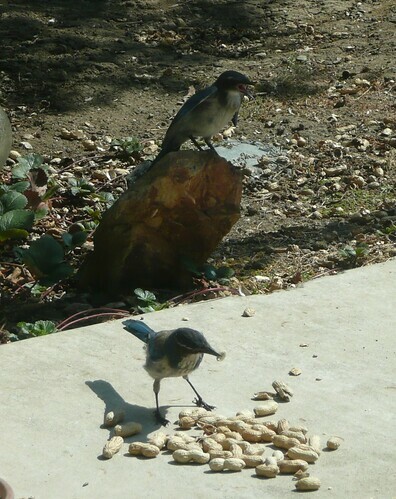 I think the one on the rock still wants to be fed because he will open his wings and make his little noise. He “screams” at the top of his voice. But scream is a harsh word since it sounds so cute, but . . . you can tell it is a workout for him. He puts a lot of effort into it. Ooooh, balancing on one foot. Good.